Lisa receives the personally delivered tickets and cards from Optimist President, Ray Venturin. The winning ticket #0932 was selected, at random, from a lottery drum in the Black Gold Optimist Club 2013 Raffle Fundraiser Draw at our meeting on Thursday evening June 13th. 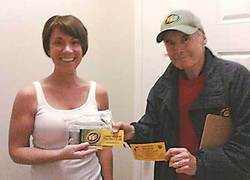 The happy winner was Lisa P. who received two 2013 Edmonton Eskimos Gold Season Tickets PLUS $350.00 in Eskimos Gift & Concessions Cards (to spend at the games). Congratulations to the winner and thanks for her support as well as all other purchasers. Proceeds from the sale of the raffle tickets go to helping youth in the community. For more information go to: leducblackgoldoptimists.com.